This genus is accepted, and its native range is Cameroon, Ethiopia to S. Africa, Madagascar, SW. Arabian Peninsula, Amsterdam & St. Paul Islands. Annual (10), or perennial (73). Rhizomes absent (78), or short (2), or elongated (2). Stolons absent (65), or present (19). Culms erect (12/26), or geniculately ascending (7/26), or decumbent (7/26), or rambling (3/26); 3-46.19-400 cm long; firm (80), or woody (2). Lateral branches lacking (44/63), or sparse (9/63), or ample (14/63). Leaf-sheath auricles absent (81), or erect (1). Ligule a fringe of hairs. Leaf-blades filiform (26), or linear (57); herbaceous (73), or coriaceous (9); stiff (42), or firm (19), or flaccid (23). Leaf-blade margins cartilaginous (1/1). Leaf-blade apex muticous (80), or pungent (7). Inflorescence a panicle (80), or composed of racemes (2), or comprising only a few spikelets (1). 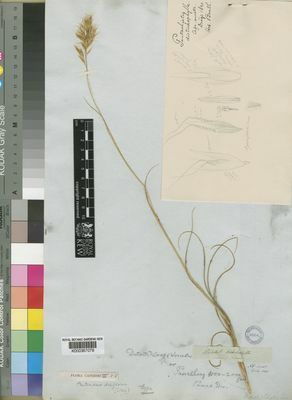 Panicle open (62/80), or contracted (20/80), or spiciform (3/80). Racemes single (2/2); unilateral (2/2). Rhachis flattened (1/2), or subterete (1/2). 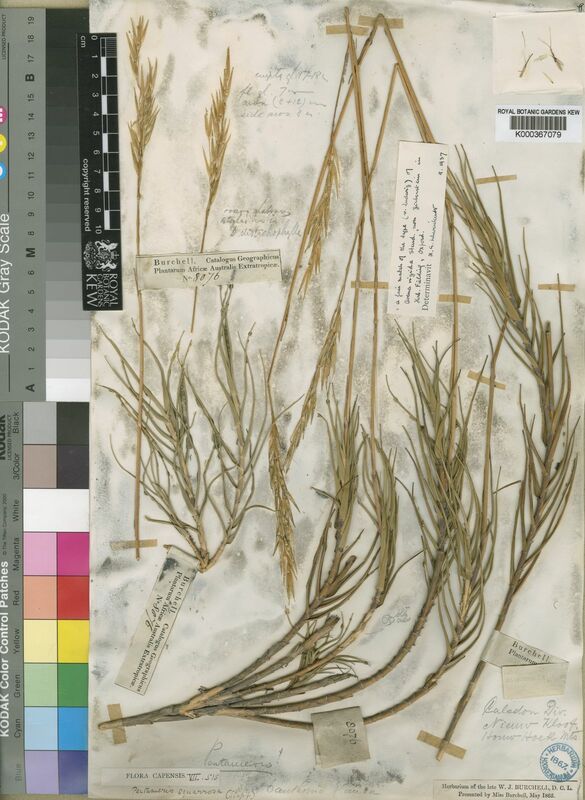 Spikelet packing broadside to rhachis (2/2); 2 -rowed (2/2). Spikelets appressed (3/4), or deflexed (1/4); solitary (81), or in pairs (1). Fertile spikelets sessile (3), or pedicelled (80); 2 in the cluster (1/1). Pedicels filiform (64/64). 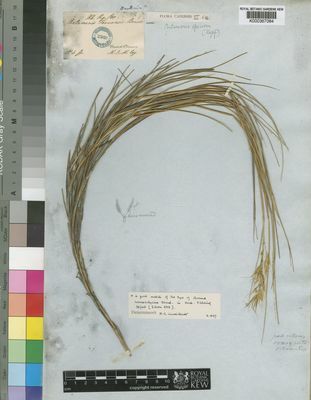 Spikelets comprising 1 fertile florets (4), or 2 fertile florets (78); without rhachilla extension (71), or with a barren rhachilla extension (19). Spikelets lanceolate (10), or oblong (3), or ovate (1), or cuneate (68); laterally compressed; 2-8.152-26 mm long; breaking up at maturity; disarticulating below each fertile floret. Floret callus brief (17), or evident (64), or elongated (1); pubescent (70/72), or pilose (1/72), or bearded (1/72); truncate (1), or obtuse (80), or pungent (1). Glumes persistent; reaching apex of florets (2), or exceeding apex of florets (81); thinner than fertile lemma (1), or similar to fertile lemma in texture (78), or firmer than fertile lemma (3); parallel to lemmas (14), or gaping (68). Lower glume linear (1), or lanceolate (11), or elliptic (68), or oblong (3); 1 length of upper glume; hyaline (1), or membranous (77), or scarious (1), or coriaceous (3); 1-keeled (77/77); 1 -veined (71/77), or 2 -veined (1/77), or 3 -veined (3/77), or 5 -veined (4/77), or 6-8 -veined (1/77). Lower glume lateral veins absent (70), or obscure (1), or distinct (11); without ribs (11/12), or ribbed (1/12). Lower glume surface smooth (73), or asperulous (18); glabrous (75), or puberulous (6), or pubescent (4), or pilose (4), or hirsute (3), or villous (3). Lower glume apex obtuse (6), or acute (24), or acuminate (51), or attenuate (6), or setaceously attenuate (3). 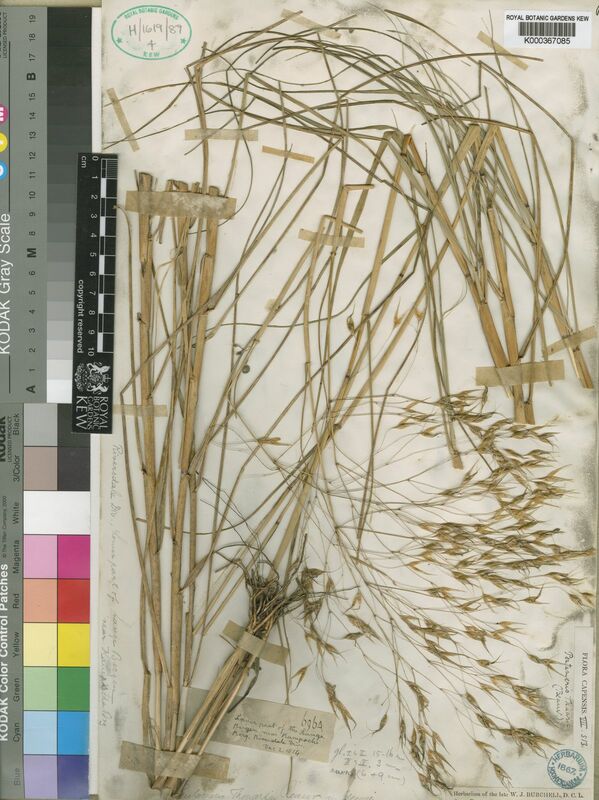 Upper glume linear (1), or lanceolate (11), or elliptic (68), or oblong (3); 1-2.11-5 length of adjacent fertile lemma; hyaline (1), or membranous (77), or scarious (1), or coriaceous (3); with undifferentiated margins (81), or membranous margins (1); 1-keeled (77/77); 1 -veined (71/77), or 2 -veined (1/77), or 3 -veined (4/77), or 5 -veined (3/77), or 6-8 -veined (2/77). Upper glume lateral veins without ribs (11/12), or ribbed (1/12). Upper glume surface smooth (74), or asperulous (17); glabrous (75), or puberulous (5), or pubescent (5), or pilose (4), or hirsute (3), or villous (3); with simple hairs (10/12), or tubercle-based hairs (2/12). Upper glume apex obtuse (6), or acute (23), or acuminate (51), or attenuate (6), or setaceously attenuate (3). Fertile lemma elliptic (1), or oblong (81); membranous (81), or chartaceous (1); without keel (78), or keeled (4); 3 -veined (3/77), or 5 -veined (64/77), or 6 -veined (63/77), or 7 -veined (71/77), or 8 -veined (67/77), or 9 -veined (68/77), or 11 -veined (1/77). Lemma midvein eciliate (75), or ciliate (7), or pubescent (1). Lemma surface smooth, or scaberulous (1); glabrous (20), or puberulous (1), or pubescent (9), or pilose (13), or hirsute (1), or villous (48); hairy on back (56/68), or on veins (9/68), or between veins (1/68), or between veins but central interspaces glabrous (1/68), or in lines (1/68); with simple hairs (66/68), or clavate hairs (2/68). Lemma margins eciliate (74), or ciliate (10). Lemma apex entire (11), or erose (1), or dentate (11), or lobed (62); 2 -fid (70/73), or 3 -fid (3/73); incised 0.1-0.3329-0.5 of lemma length; truncate (6/23), or obtuse (3/23), or acute (10/23), or acuminate (4/23); muticous (14), or awned (69); 1 -awned (1/69), or 3 -awned (68/69), or 4-5 -awned (1/69). Principal lemma awn from a sinus (69/69); straight (2/69), or curved (1/69), or geniculate (66/69). Lateral lemma awns shorter than principal (67/67). Palea 0.8-0.9875-1.1 length of lemma; 2 -veined (13/13). Palea keels separated (79), or approximate (3); eciliate (78), or puberulous (3), or ciliate (1). Palea surface glabrous (54), or pubescent (26), or pilose (3), or villous (7). Palea apex dentate (2/2); muticous (80), or with excurrent keel veins (1), or awned (1). Lodicules 2 (80/80); fleshy (66/66); glabrous (78/80), or ciliate (3/80). Anthers 3 (75/75). Ovary glabrous (1/2), or pubescent on apex (1/2). Caryopsis with adherent pericarp (68/78), or free brittle pericarp (10/78); fusiform (3/4), or orbicular (1/4); isodiametric (1/1). Africa (81), or Temperate Asia (1), or Australasia (2), or Antarctica (1). Inflorescence a panicle, open or contracted to spiciform. Spikelets 2-flowered with rhachilla extended as a minute bristle; glumes subequal, as long as the spikelet; floret callus short, obtuse; lemmas dorsally rounded, finely 5–9(11)-nerved, pilose on the back, 2-lobed at the apex, awned from the sinus and also with a fine straight bristle from the inner side of each lobe, rarely awnless; palea about as long as the body of the lemma, the keels glabrous, wingless.